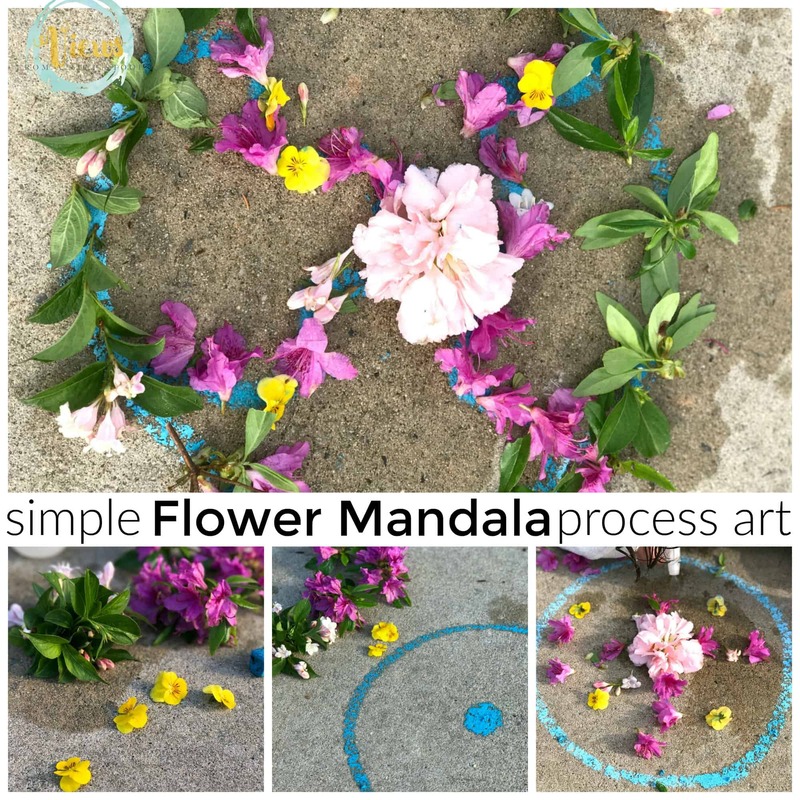 This flower mandala process art was such a fun activity for my kiddos! 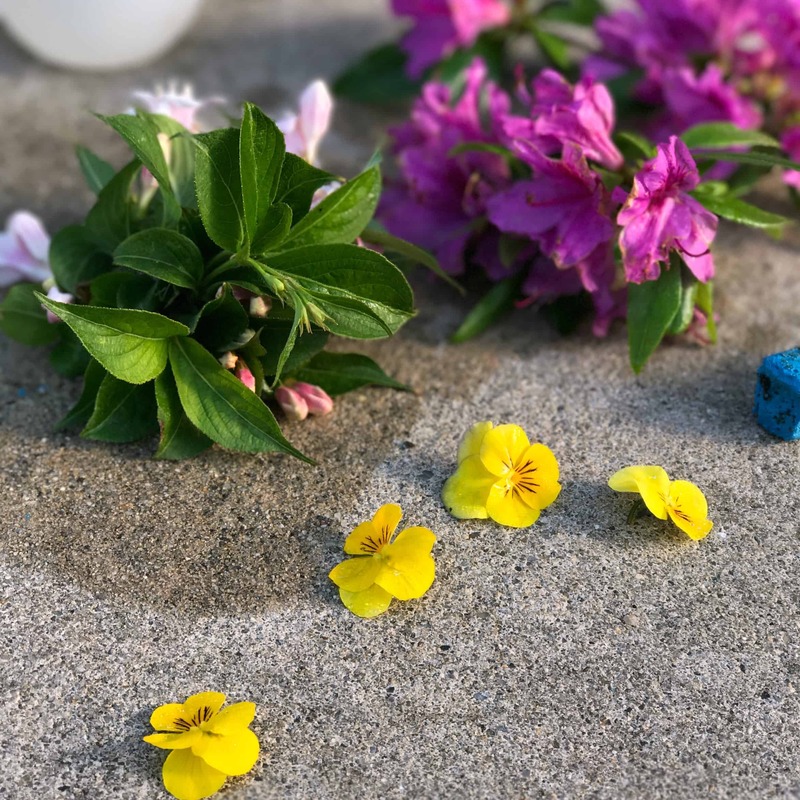 We originally set out to work with flowers and a spray bottle making resist art on the sidewalk. 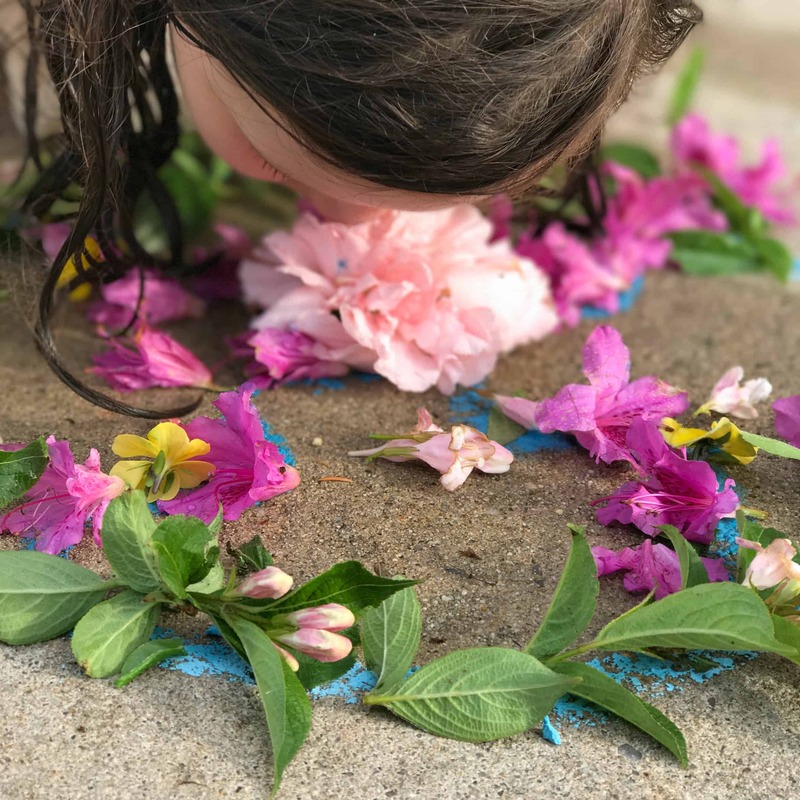 This method kind of worked, and the kids enjoying finding dry areas of sidewalk where the flowers had been, but we didn’t make anything that resembled artwork per se. 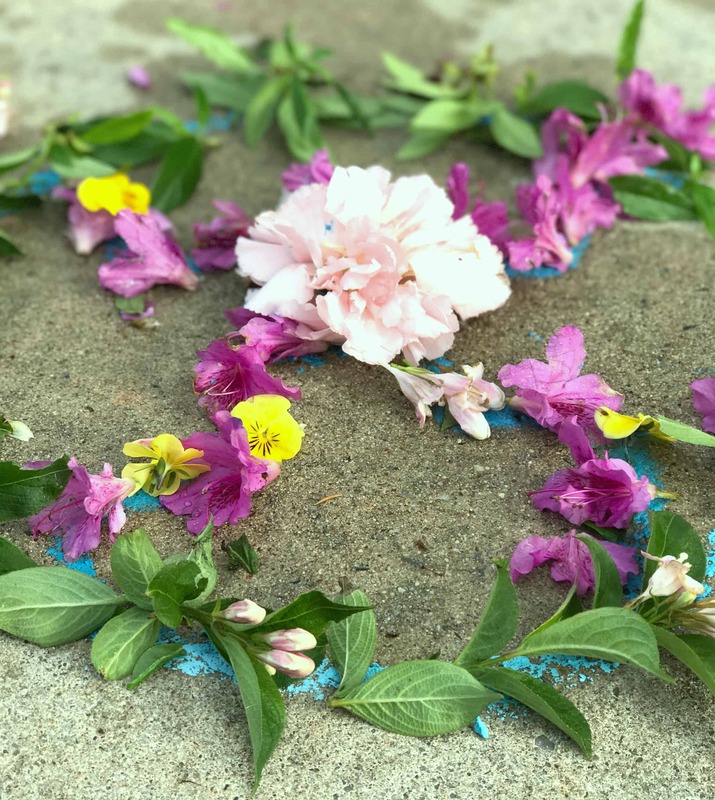 We then took our flowers and some sidewalk chalk and created these beautiful flower mandalas! A mandala is a circular design that many have taken different interpretations of, though originally a spiritual symbol. 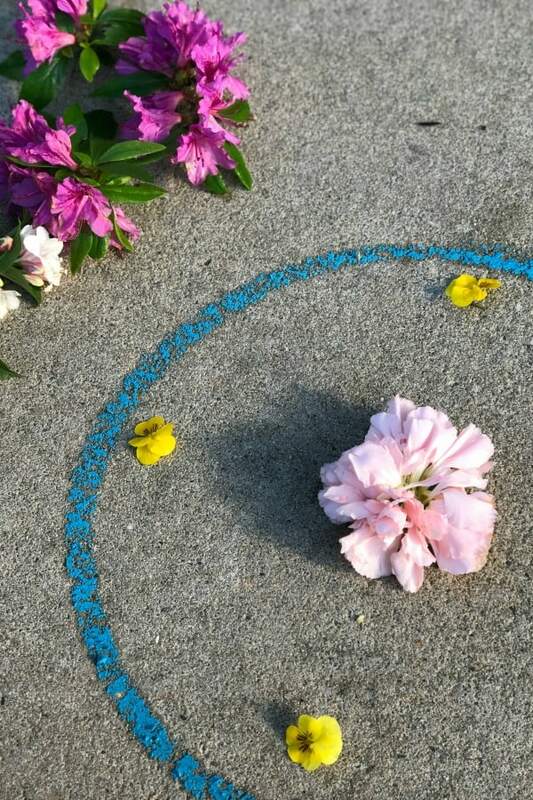 For our design we used sidewalk chalk as a template since my kids are on the young side (2, 3 and 6). My 3 year old enjoyed this the most and really got into the design and pattern-making of the process. 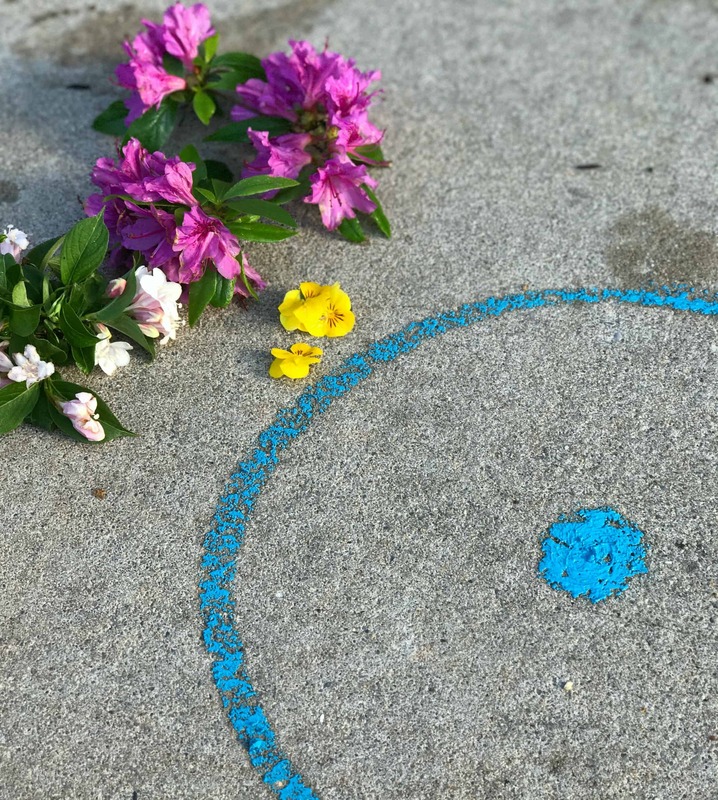 Draw a circle template with the sidewalk chalk. 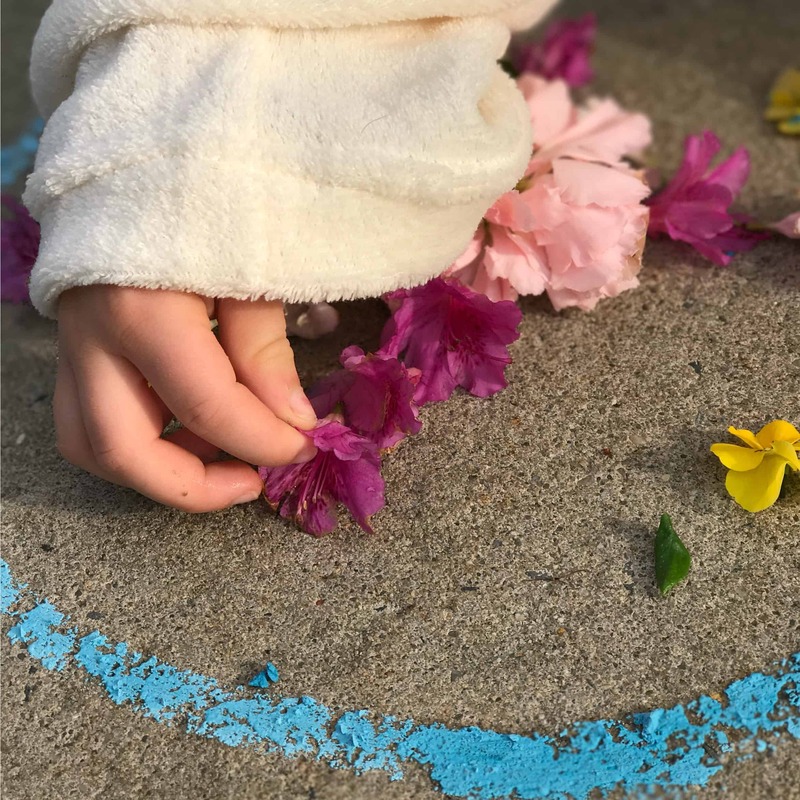 Mark a center point to start as a starting place for your child to begin the mandala. 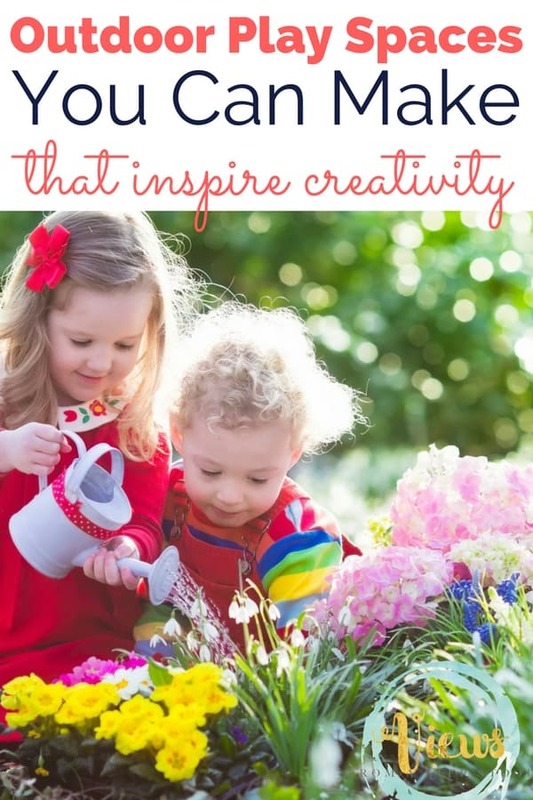 Allow your child the freedom to create their own pattern and design within the circle! 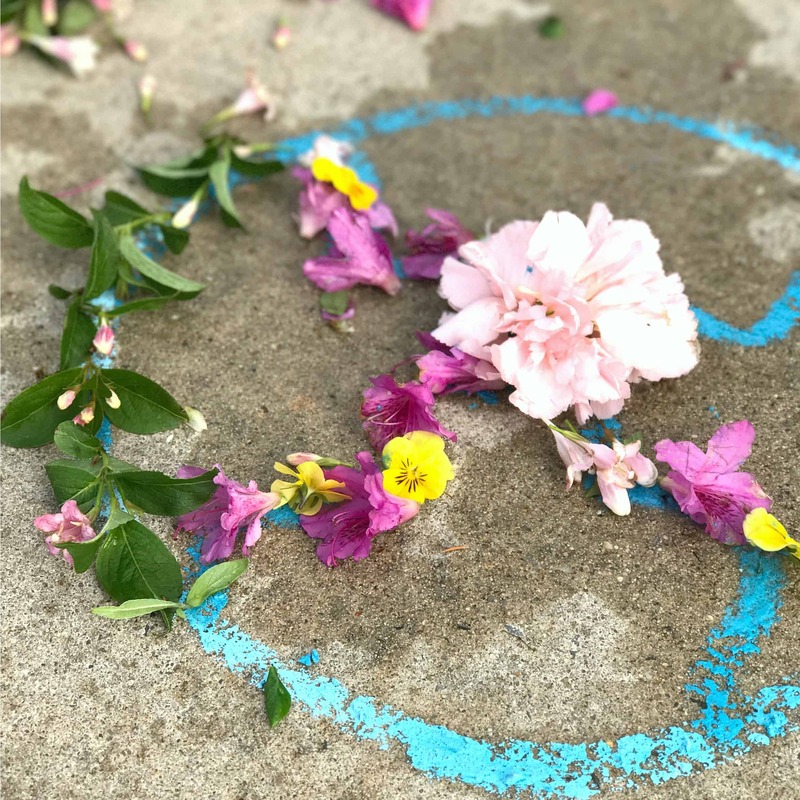 We messed around with some different designs, and at one point I made a new template with squiggly designs inside the circle to provide my preschooler with some more inspiration. 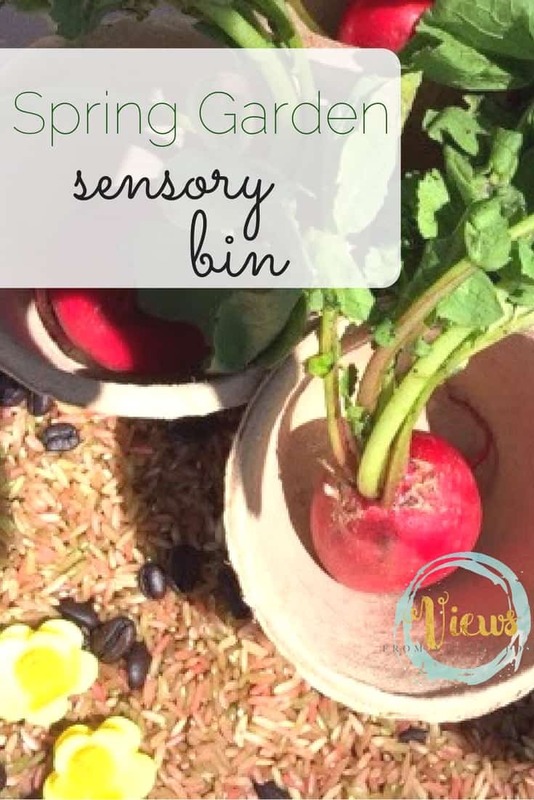 They were a wonderful way to celebrate Spring. We have decided to leave them out on the sidewalk for others to see until the wind took them away. 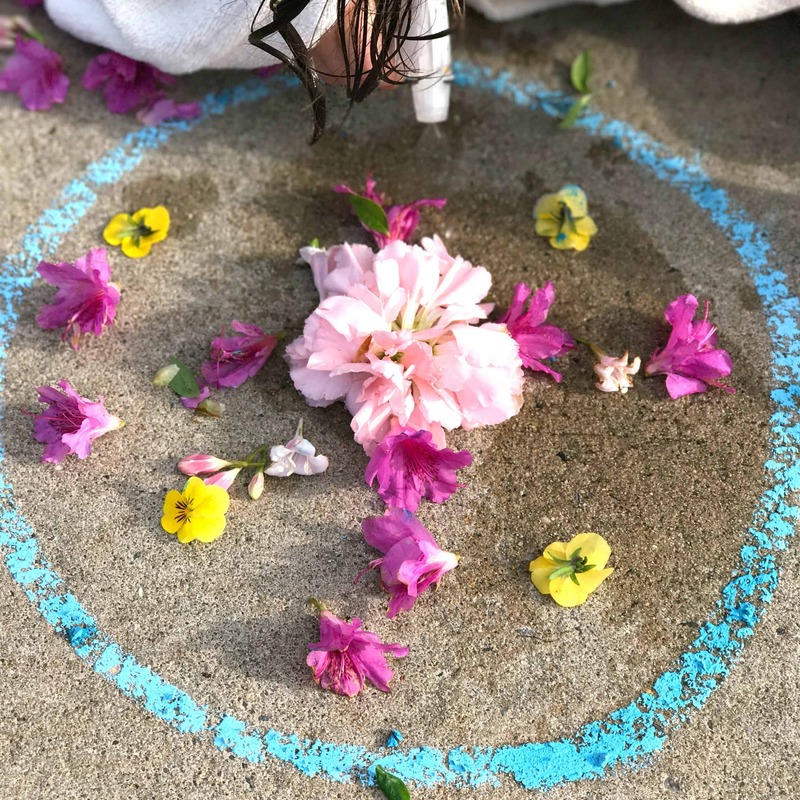 My daughter did take our original idea of spraying the flowers with the spray bottle and apply it to the mandala! 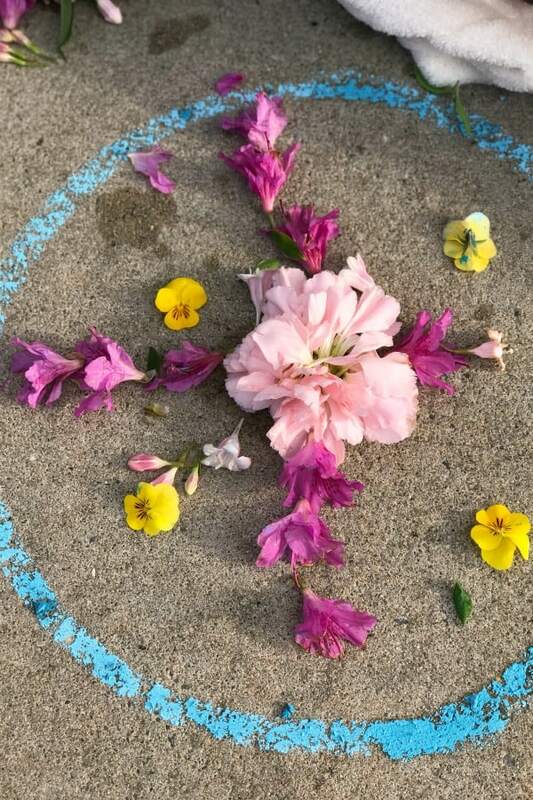 This worked much better than our original idea, and while we didn’t get a complete resist print of the flower mandala, we were able to investigate and identify areas where our flowers had been. 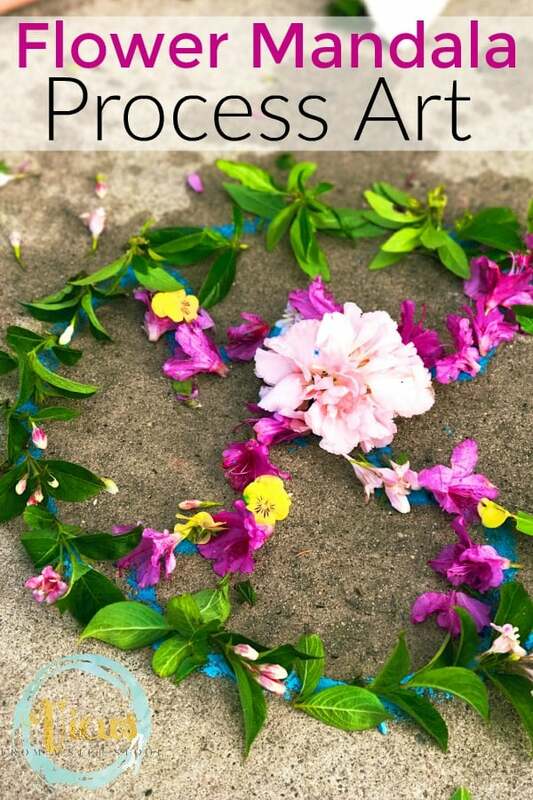 What a fun combination of science and process art this turned out to be!